The Adobe InDesign CC Digital Classroom Book 2015 edition is like having a personal instructor guiding you through each lesson, while you work at your own pace. This InDesign CC book with video training includes 14 self-paced lessons helping you learn essential skills and explore new features and capabilities of Adobe InDesign CC 2015 and updated to include 2016 InDesign CC revisions. Covers all essential InDesign skills. Update for InDesign CC 2015 including the mid-year 2016 InDesign CC update. This book is available to schools and training centers directly from American Graphics Institute in either print or digital format. Contact American Graphics Institute for details. 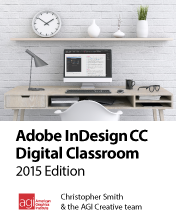 Download the InDesign CC Digital Classroom 2015 edition table of contents (PDF). Download InDesign CC Digital Classroom 2015 edition sample chapter (PDF).